Saturday, September 27, 2014 - 1:00 p.m. THE MATCHUPWilkes University hosts defending MAC co-champion Lycoming College Saturday on Homecoming 2014 at 1:00 p.m. at Schmidt Stadium. Colonels coach Trey Brown (Colorado '93) enters his first year at the helm of the program in 2014. Brown comes to Wilkes after four years serving as the quarterbacks and special teams' coordinator at Muhlenberg. In his role with the Mules, Brown was responsible for coaching the quarterbacks, wide receivers, and special teams as well as the installation of the pass game. Prior to his time at Muhlenberg, Brown spent four seasons as offensive coordinator and quarterbacks coach at Lehigh University. The Mountain Hawk offense scored 30 or more points 15 times during his tenure and led the Patriot League in scoring in 2006, when its quarterback was named to the All-Patriot League first team. Brown coordinated an offense that averaged 32.3 points in league games in 2008 and 27.3 points in 2009. Lehigh scored more than 80 percent of the time it reached the Red Zone both seasons, including a Patriot League-best 87.9-percent efficiency in 2008. Mike Clark (Lycoming '93) is in his seventh season as head football coach at his alma mater Lycoming College. Clark has been a part of 99 wins, eight MAC titles, seven NCAA playoff teams and six NCAA playoff wins as a Warrior. During his time as head coach, Clark has tutored 62 all-conference selections, 15 all-region selections, seven All-Americans, three Academic All-District selections, an Academic All-American, a Regional Player of the Year and led the team to six wins over top-25 programs. The 2013 Warriors were able to sustain a rollercoaster ride throughout the season and still capture a share of the program's 15th MAC title, posting a 7-3 record and a 7-2 mark in league play. The team started the year with a 4-1 mark, which included wins over 24th-ranked Widener and 16th-ranked Delaware Valley. After a loss to Co-MAC champion Lebanon Valley, the Warriors finished the year with three wins in four games, including a 36-20 win over Stevenson to clinch a share of the title in the season's final weekend. This will be the 55th meeting between the two schools as Lycoming holds a 37-17 series advantage. Last season, the Warriors upended Wilkes 34-18 in Williamsport, Pa. The Colonels have won three of the last four meetings at Schmidt Stadium. Wilkes welcomes FDU-Florham to Schmidt Stadium at 1:00 p.m. to conclude its fourth of five home games to start the year. 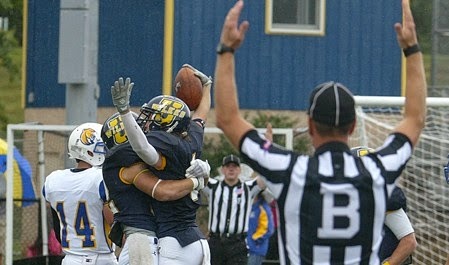 Wilkes has dominated the series against the Devils holding a 28-2 lead including a 38-16 win last year in Madison, NJ. Sophomore signal caller Ryan Dailey (Easton, PA/Wilson) continued his fine performance with a career night at DVC throwing for overall bests of 323 yards on 29-of-56 passing. His 56 attempted passes was just seven short of the school record of 63 set by Brad Scarborough against Lycoming in 1986. Over the past two games for Wilkes, Dailey has thrown for 535 yards and five touchdowns. Senior wideout Jonathan Conklin (Sussex, NJ/Vernon) used his arms in a variety of ways at DVC last week, catching a career-high eight passes for 85 yards and a score, while also throwing two touchdown passes. He first took a designed pitch from Dailey and found Tim Bousson (Shamokin, PA/Shamokin) for a six-yard score early in the first, then later in the third hit Jacob Brook (Layton, NJ/Kittatinny) on a fake field goal attempt for a 15-yard touchdown. For the season, Conklin has posted a team-high 10 catches for 106 yards and one touchdown. The Wilkes receiving corps had its best outing this season at DVC as a school record 12 Colonels caught passes in the contest. Aside from Conklin's eight grabs, Bousson added four receptions for 73 yards, while Ryan Richards (Plainsboro, NJ/Jersey Coast Prep),William Deemer (Washington Township, NJ/Warren Hills) and Drew Devitt (Sinking Spring, PA/Wilson) all accounted for three receptions each. Jeremy Hartman (Little Egg Harbor/Pinelands Regional), Ryan Casey (Manasquan, NJ/Manasquan) and Ryan Behrmann (Seven Valleys, PA/Dallastown) each added two catches each as Wilkes hauled in 31 balls for 344 yards and a season-high four scores against the Aggies. The Wilkes offense showed just how fast coach Brown wants to play as the Colonels set an NCAA Division III regulation record running 113 total plays at DVC. The regulation record for plays was 112, set by Gustavus Adolphus in 1985. The overall record is 114, set two weeks ago by Rose-Hulman. Wilkes sits atop the MAC with 231 total plays through three games including 308 rushing and 709 passing. The Colonels rank in the top five in both rushing (fifth) and passing (third). Sophomore linebacker Tanner Stengel (Allentown, PA/Parkland) has enjoyed a fine start to his season posting a team-best 26 tackles including 19 solo stops. Stengel currently ranks third in the MAC in total tackles while ranking second behind Frank Gaffney of LVC (23) in solo stops. He averages 8.7 tackles per-game for a Wilkes defense that allows 368.3 yards of total offense through three games. The Warriors enter the week third in the Middle Atlantic Conference with a scoring average of 32.0 points per game, while the team's 362.0 yards of total offense also ranks third. The Warriors are second in the league with a 161.49 passing efficiency, as senior quarterback Tyler Jenny has notched a 65.4 completion percentage. He is also third in the league in passing yards per game at 232.0. Senior Craig Needhammer is third in the MAC in rushing, averaging 104.3 yards per game, while his six rushing touchdowns is tied for the league lead. Junior Ryan Umpleby is one of two receivers amongst the league's top 10, sitting fourth with 84.3 yards per game while senior John Sibel is seventh at 63.0. Having given up just three touchdowns in the first three games, the Warriors are amongst the top defenses in Division III early this year. They are 13th in the nation in scoring defense (8.7) and eighth in total defense (208.7).The squad leads the MAC in 3rd-down conversion percentage (.200), first downs allowed (37) and rushing defense (70.3). The Warriors have been able to consistently pressure behind the line of scrimmage, as the team has notched 29.0 tackles for loss this year. Three Warriors are in the top 10 in the MAC in the category, with junior Cole Welham second in the league at 2.5, senior Jimmy Nottingham fifth with 1.5 per game and junior Brian Campbell ninth at 1.3 per game. Welham is also second in the league with 1.33 sacks per contest. Junior Matt Malecki leads the team with 20 tackles while Campbell has posted 17 stops.